Decontamination refers to steps taken to ensure that a medical instrument is safe for handling by reducing its contamination with microorganisms. This step results in the inactivation of hepatitis B virus and HIV. Cleaning ensures the removal of biological material from the instruments. The destruction of all micro-organisms, including bacterial spores on an instrument, is referred to as sterilization. When sterilization equipment is not available, or the instrument cannot be sterilized, high-level disinfection (HLD) is used. HLD results in all forms of microbes, except bacterial spores, being destroyed. Strict implementation of the above procedures according to a written manual is helpful in quality assurance of safe utilization of reusable instruments. The basic steps involved in the safe utilization of reusable instruments for colposcopy and treatment of cervical intraepithelial neoplasia (CIN) are summarized in this chapter. A thorough knowledge and understanding of the steps in the high-level disinfection (HLD)/sterilization process is absolutely essential, as it ensures that the instruments used are free of infectious agents. Any lack of compliance with this process can lead to contamination of the sterilized instruments and harm to the patient. The process for re-use of the instruments begins with decontamination and continues through cleaning, sterilization/HLD, storage and handling. A quality assurance programme will help to ensure that instruments are processed adequately for re-use. 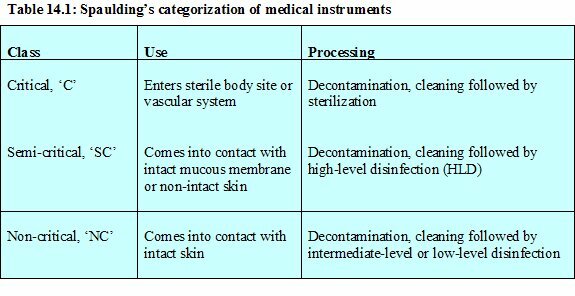 There are three basic steps before instruments, used for clinical and surgical procedures, can be reused: decontamination, cleaning and sterilization/HLD. These are briefly discussed and the methods used for sterilizing different instruments are described. Decontamination comprises a series of steps to make a medical instrument or device safe for handling by reducing its contamination with microorganisms or other harmful substances. Usually, these procedures are performed by the nursing, technical or cleaning staff, and decontamination protects these workers from inadvertent infection. If these procedures are carried out properly, decontamination of the instruments will be assured before handling for cleaning. This step results in the inactivation of most organisms such as hepatitis B and HIV. Further processing is necessary to ensure that the object is cleaned and then sterilized. Cleaning is a crucial step in providing safe, infection-free instruments. Vigorous manual cleaning with running water and liquid soap or detergent removes biological material such as blood, body fluids and tissue remnants. Instruments should be cleaned as soon as possible after use. If biological material is left behind, it can act as a sanctuary for residual microorganisms, protecting them from the effects of disinfection and sterilization. Sterilization is defined as the process of destroying all microorganisms on an instrument by exposure to physical or chemical agents. This process kills all forms of microbial life including bacterial spores. In practice, sterility is considered to be achieved if the probability of a surviving microorganism is less than one in a million. The sterilization process is fundamental for the safe reuse of instruments in clinical care. When sterilization equipment is not available, or the instrument cannot be sterilized, HLD is used. Disinfection implies that the microbial burden of an instrument is reduced, but not entirely eliminated. The extent of this reduction depends upon the disinfection process used and the resistance of the microbial forms present. In practice, however, HLD results in all forms of microbial life being destroyed except bacterial spores. Immediately after use, place instruments and other items, such as gloves, in a clean large plastic bucket containing 0.5% chlorine solution for 10 minutes. The 0.5% chlorine solution can be prepared by adding one part of concentrated household bleach (sodium hypochlorite solution, 5% available chlorine) to nine parts of water. The general formula for making a dilute solution from a commercial preparation of any given concentration is as follows: Total parts of water = [% concentrate/% dilute] -1. For example, to make a 0.5% dilute solution of chlorine from 5% concentrated liquid household bleach = [5.0%/0.5%] -1 = 10-1 = 9 parts of water; hence add one part of concentrated bleach to nine parts of water. Grams/litre = [% dilute/% concentrate] x 1000. For example to make a 0.5% dilute chlorine solution from a dry powder of 35% calcium hypochlorite = [0.5%/35%] x 1000 = 14.2 g. Hence add 14.2 grams of dry powder to 1 litre of water or 142 grams to 10 litres of water. The instruments should not be left in dilute bleach for more than 10 minutes and should be cleaned in boiled water immediately after decontamination to prevent discolouration and corrosion of metal. Thorough manual cleaning of instruments with water and detergent to remove all organic material, after decontamination in 0.5% chlorine solution for 10 minutes, is of the utmost importance before to sterilization or HLD. A brush should be used to scrub the instruments free of biological matter. Instruments should be cleaned as soon as possible after use, so that no organic material will dry and stick to the instruments, providing a sanctuary for microbes. The person cleaning should use utility gloves while washing instruments. Protective glasses or goggles should be worn by the cleaners to protect their eyes from contaminated water. Special attention should be given to instruments with teeth (e.g., biopsy punches), joints and screws (e.g., vaginal specula), to which biological material can become stuck. After cleaning, rinse the instruments thoroughly with boiled water to remove detergent residue. 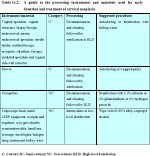 Instruments that are considered ‘critical’ (instruments entering sterile body tissues or vascular system, see Table 14.1, e.g. biopsy punch, surgical instruments, electrocautery tip, vaginal specula) require sterilization before re-use. Two methods of sterilization are described here. High-pressure saturated steam sterilization using autoclaves is recommended for sterilization. Unwrapped instruments should be exposed for 20 minutes to temperatures between 121-132oC at a pressure of 106 kPa (15 lb/inch2). You should follow the manufacturer’s advice, as pressure settings may vary slightly depending on the make of the autoclave. Small wrapped packs of instruments should be exposed for 30 minutes. The material used for wrapping should be porous enough to let steam through. Wrapped sterile instruments have a shelf life of up to seven days, if kept dry and intact. Unwrapped instruments should be placed in a sterile container. Small autoclaves are ideal for use in clinics. Chemical sterilization by soaking in 2-4% glutaraldehyde for 8 to 10 hours or 24 hours in 8% formaldehyde is an alternative to steam sterilization. This requires special handling with gloves, and the instruments thus sterilized should be rinsed with sterile water before use, as these chemicals form a residue on the instruments. Glutaraldehyde is very expensive, while formaldehyde is more irritating to skin, lung and eyes. Steam sterilization is preferred to chemical sterilization. (a) Boiling plain tap water in a clean vessel offers a cheap and readily accessible form of HLD. The contact time for instruments should be at least 20 minutes after boiling has started. Water in the vessel should be changed daily. The vessel should be washed and kept dry every day. 0.1% Chlorine solution: If boiled water is used to make the solution, 0.1% chlorine may be used for HLD. If not, one should use 0.5% solution. The contact time required is 20 minutes. The solution is very corrosive to stainless steel. After disinfection, instruments should be thoroughly rinsed with boiled water and then air-dried or dried with a sterile cloth before use. The shelf life of prepared solution is one week. 6% Hydrogen peroxide solution:It can be prepared by adding one part of a 30% solution to four parts of boiled water; the contact time is 30 minutes. After disinfection, instruments should be thoroughly rinsed with boiled water and then air-dried or dried with a sterile cloth before use. However, this solution will damage the external surfaces of rubbers and plastics, and corrode copper, zinc, and brass instruments after prolonged use. 2% Glutaraldehyde: It must be prepared according to the manufacturer’s instructions; activated 2% solution in a covered container has a shelf life of two weeks. The contact time is 20 minutes. As glutaraldehyde forms a residue on instruments, which is toxic to tissues, the instruments must be rinsed thoroughly with sterile water and dried with a sterile cloth before use. Strict implementation of decontamination, cleaning, and sterilization or HLD of instruments, according to a written manual is helpful in quality assurance of the procedures. The manual must be prominently displayed in the clinic for ready reference. The quality assurance process includes regular audits, analysis, system adjustments and education. The audits should include review of the methods of sterilization used, the items being sterilized, the length and temperature of exposure, identification of the person performing the sterilization, and periodic review and inspection of equipment being used for sterilization. The frequency of pelvic infection following clinical procedures in this context (i.e., screening, early detection and treatment of cervical pre-cancer) is a good indicator of the quality of sterilization process in place. Spaulding categorized medical instruments as ‘critical’, ‘semi-critical’, or ‘non-critical’, according to how they are used (Table 14.1). This is useful in guiding their processing for reuse. Intermediate-level disinfection results in destruction of Mycobacterium tuberculosis, vegetative bacteria, most viruses (HIV, hepatitis B and herpes Simplex viruses) and most fungi (Candida, Aspergillus), but does not kill bacterial spores. Low-level disinfection destroys most bacteria, some viruses, some fungi, but not Mycobacterium tuberculosis or bacterial spores. 60-90% ethyl or isopropyl alcohol or iodophors such as 10% povidone iodine act as intermediate or low-level disinfectants. While alcohol does not leave a residue on instruments, iodophors do. 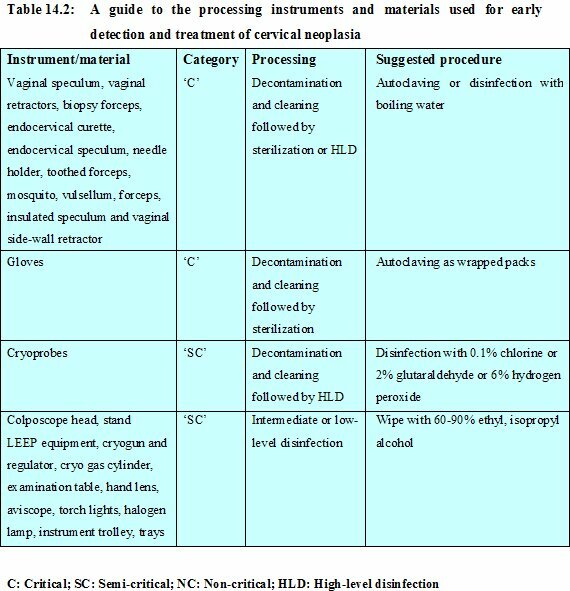 A guide to the processing of instruments and materials used for screening of cervical neoplasia, colposcopy and treatment of CIN is given in Table 14. 2. Procedure tables, trolleys, equipment (colposcope, cryosurgical equipment, electrosurgical generator, smoke evacuator, halogen lamp, etc.) in the screening clinic may be contaminated with body fluids such as vaginal secretions, purulent discharge, blood, etc. While the surface of the procedure table should be decontaminated after each patient procedure, the other surfaces should be decontaminated on a daily basis by wiping with 0.5% chlorine solution, 60-90% ethyl or isopropyl alcohol or other chemical disinfectants such as iodophors. The floor of the screening clinic should also be decontaminated on a daily basis.